Before we get into the Subject of whether or not we're ready for the Second Coming, let's settle the question of whether or not we can recognize the Second Coming or make it into the Resurrection or Rapture based on what our Parents, Grand-Parents and ancestors believed in previous Ages? Well, would man be able to fly from one country to another, go to the moon or mars based on what our ancestors knew and believed. Of course the answer is "NO!" Of course, today's scientists do not "fault" previous generations for not being able to do what this generation can do. They had not progressed in scientific revelation and understanding to do these things. It's the same in the "Spiritual Realm" - previous generations walked in the measure of Spiritual LIGHT which God had ordained for their day. Paul, in Hebrews 6 did encourage the Believers to "go on to perfection". Don't stay with the basics principles. If we fail to move on with God in the Progressive Revelation of His Word then we are backsliding, not in our flesh but in our "souls". "If we were once enlightened, tasted of the heavenly gift, made partakers of the Holy Spirit and the powers of the world to come...it is impossible to renew us again to repentance if we willingly refuse to go further with God." Read Hebrews 6:1-6. Disobedience will keep us out of the Rapture. God requires a lot more of us in this LAST Age then He did of previous Ages. They didn't need the knowledge and revelation of the Rapture and Second Coming which we need. Keep this in mind as we consider our own readiness for what God is Doing TODAY. Are you ready for the Coming of the Lord? Are you expecting the Resurrection of the Dead in Christ? Are you anticipating the "changing of your own body" to be caught away with the Resurrected Saints to meet the Lord in Glory? Remember the Bible says, ".....unto them that look for him shall he appear the second time without sin unto salvation." Hebrews 9:28. Are you sincerely, from your heart "looking for" and "expecting" the Second Coming of Christ wherein we will receive a body "fashioned like unto His Glorious Body"? Philippians 3:21. Like Paul, do you have a heartfelt desire to leave this old sin-cursed world and go to be with Jesus? "We are confident, I say, and willing rather to be absent from the body, and to be present with the Lord." 2nd. Corinthians 5:8. The Signs spoken of in Scripture are all around us. The Forerunner promised in Malachi 4:5-6 has come and gone, leaving a Message wherein lays the Revelation of the Second Coming of Christ, the Resurrection of the Dead in Christ, and the "Catching Away" of the FEW, VERY FEW Living Saints who are READY. Remember, There won't be many "living Saints" on the earth at the time of the Second Coming of Christ, the Rapture and the Resurrection of the Dead IN Christ. Most of those who will be a part of HIS Bride are already in that other dimension waiting for the FEW "Living Saints" to get ready. This is the hour wherein Christ said, "When the Son of Man cometh, shall He find Faith on the earth?" (Luke 18:8) The Faith referred to here is "a belief in the 'whole body' of revealed Truth". There'll be a lot of religion and churchanity, but VERY LITTLE Holy Ghost Faith. The people know more about the Church than they do about Christ and even less about His Word. In and through the ministry of the "forerunner to the Gentiles" our "Lord, Himself descended from heaven with a shout", giving to the Bride of this Age the "whole Body" of revealed Truth, to give her Faith to walk of the earth without seeing death. (1st. Thess. 4:15-18.) But, as stated above there won't be many. "As a thief in the night He has came", (1st. Thess. 5:2-4), calling His Elect Bride, giving her His Word, causing her to "line up with all of it" to receive Rapturing faith. As the Logos Word of God was made flesh and Raptured (caught up) in the Bridegroom (Acts 1:9) even thus shall it be made flesh and Rapture (caught up) in the end time Bride. Praise the Lord! Are You Part of that Bride? But, I ask again are we ready for this great event, daily lining up with the Word, getting closer to the Lord, building ourselves up in the most holy faith and becoming more conscious of eternity than of time. Like Jesus as He neared the end of His ministry "He knew that HIS hour was come to depart out of this world unto the Father" (John 13:1); even so the Bride "knows that HER hour has come to depart out of this world unto her Bridegroom". 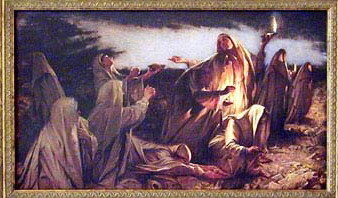 She has heard the shout of the forerunner and is awake and "trimming her lamps to go in to the Marriage Supper of the lamb". (Matthew 25:7) Hallelujah! Do you, like the WISE virgins, have that "extra oil" of the Revealed Word for this age with which to trim your lamp? Be wise in the WORD, not "fools and slow of heart to believe ALL that the prophets have spoken" Luke 24:25 - Thus did Jesus say to the Disciples on the road to Emmaus. Disciples who were pondering the First Coming of our Lord, but failed to understand that HIS rejection by the Church of that day and HIS Crucifixion was ALL fulfilling Bible Prophecy. Remember our Lord did come the First time and will return the Second time exactly according to the Scriptures - not according to the pre-conceived ideas and interpretations of man. In His First Coming, the forerunner, John The Baptist, came with a "Message" which revealed the "Mystery" of His Coming. The Alpha Ministry of our Lord Jesus Christ - from His birth in a manager to His death on the Cross was a Mystery to the people. He showed the "Messiah Sign", discerning the thoughts and intents of the hearts of the people. Even Nicodemus, a sincere Pharisee, admitted "we know that thou art a teacher come from God: for no man can do these miracles that thou doest, except God be with him." John 3:2. They acknowledged His miracles but could not recognize or come subject to His Message. The dispensation was changing from law to Grace. In this Age the dispensation is changing from Grace to Judgment. The Pharisees were so set in their church ways they were blind to Truth. In this Age of the Omega Ministry of our Lord Jesus Christ people are so set in their religious ways that they are "willfully blind" to the Truth - willingly ignorant - 2nd. Peter 3:5. The religious people of John the Baptist's days refused to allow their "hearts to be turned back" to the Truth from which they had drifted. The vast majority of the religious people of this Age have drifted from the Truth into church creeds, modernism and hypocrisy. They refuse to go on to higher heights and deeper depths in the Word to get Rapturing. John The Baptist's Message gave the Disciples the "Faith" or Revelation of the First Coming. The Faith or revelation of the Second Coming, resurrection and Rapture lays in the "back to the Word Message" of William Branham, the forerunner and messenger of the Second Coming. We must needs examine ourselves in the Light of the forerunner's Bible Vindicated Message to see whether or not we are in the faith of the Second Coming - READY for the secret "catching away" of the Living Saints.